According to a study conducted by Danish geneticist Hans Eiberg from the Institute of Biochemistry at the University of Copenhagen, 99 percent of Estonians have blue eyes. This surprising study has revealed that Estonia has the highest concentration of blue eyed people in the world followed by other Nordic countries which rate at over 80 per cent. In Germany, 75 percent of the population have blue eyes and in Ireland the figures are high too. In the United States 1 in 6 people have blue eyes, approximately 16.6 percent of the population. Findings from extensive genetic research tell us that every person with light coloured eyes has a common ancestor who lived in the Black Sea region around 10,000 years ago. As this person's offspring gradually drifted away from its point of origin and migrated north to colder climates, blue eyes gradually became a dominant feature in Northern Europe. Looking at my own family, I can see the pattern. Two of my sisters have blond hair and blue eyes, so does my father and his father before him. My great-grandmother had blue eyes and my grandmother had grey. One of my sisters has four children and two of them are blond haired with blue eyes. Very Estonian! 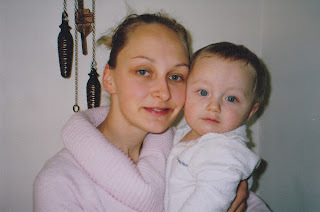 My sister Sarah and her son Jakob are both blue eyed. The Economist - "Not only Skype"
My Summer Holiday to Estonia is Booked!